We can arrange a charter on any ocean, sea, or lake in the world. We currently have only a small fraction of our charters on the web, but below are a few of our favorite destinations. Contact us to start working on your perfect yacht charter vacation! Alaska stretches across 586,000 square miles of untamed wilderness and is about one-fifth the size of the United States. Alaska features over three million lakes, 3,000 rivers, 1,800 islands, and more than 100,000 glaciers. Alaska is so big it encompasses many ecosystems, from the dry arctic tundra, to the moist rain forests of the Inside Passage. There are few places on earth with the breathtaking beauty and grandeur of Alaska. With its sweeping mountain ranges, vast glaciers and countless populations of wildlife, the only way to experience the best of Alaska is on a yacht which allows you access to places cruise ships cannot visit. “To the lover of wilderness,” Jon Muir wrote over a century ago, “Alaska is one of the most wonderful countries in the world.” And, indeed, even today Alaska feels like a land unto itself. Sometimes you can encounter spectacular glaciers ‘calving’ small icebergs, or experience the yacht surrounded by whales. Occasionally you can even catch a glimpse of a bear and cubs sauntering along the shore or catching salmon. Unique wildlife viewings is one of the highlights of your Alaskan adventure. The hidden coves and anchorages give you an intimate feel of nature and tranquility. The wonders of humpback whales breaching, stellar sea lions, orcas, porpoise, flocks of birds, and the Northern Lights are just some of the possible sightings. During voyages you can chose to spend most of your time in the wilderness, but typically we include a visit or two to one of the quaint, small Alaskan towns to give a sense of life in the region and allow you to meet the local wildlife. The Cook Islands take their name from the illustrious explorer of the South Pacific, Captain James Cook, who first discovered the islands in 1773. However, we now know that the island of Rarotanga was first sighted in the 7th and 8th centuries during the great migratory voyages of the Polynesians. Rarotanga’s first real claim to fame was its re-discovery in 1789 by the HMS Bounty mutineers before they settled at Pitcairn. There are fifteen islands in the group and they are scattered over an area of more than two million square kilometers between Tahiti to the east and Tonga to the west. Rarotanga lies just within the tropics, which places it almost in the same relative position below the equator that Hawaii is above. The main island of Rarotanga is almost completely surrounded by reef. The interior is mountainous and rises to 2,00ft. 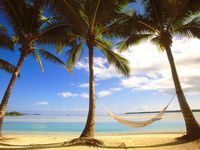 The Pacific Islands are a romantic paradise and inspired the likes of Somerset Maugham, Michener and Rodgers & Hammerstein. Fiji is made up of over 300 islands. At the crossroads of the Pacific, Fiji combines Melanesian and Polynesian cultures. The islands and lagoons boast miles and miles of pristine coastline. Uncover a new adventure everyday – swim with manta rays, snorkel, fish, go beachcombing, reef walking, hike or just enjoy the splendor of the natural world. The Fiji Islands are an excellent sailing and yachting environment – beautiful blue waters, gentle breezes, unspoiled coral reefs and many islands to explore. An Ocean Voyages yacht charter provides access to remote areas seldom visited by other travelers. It is exhilarating to voyage off the beaten path much like Maugham might have done a century ago. Vanuatu, about three days sail from Fiji, is an archipelago of 83 islands withintact tribal communities, uninhabited islands, and incredible underwater beauty. It has the feel of Tahiti 40 years ago. Port Vila, the national capital of the island of Efate offers stunning views over its harbor. The town is a combination of Melanesian, French and British influences and is active with tiny cafés and restaurants and offers panoramic harbor views. Many of Vanuatu’s islands are quite inaccessible to major tourism, allowing preservation of the tribal cultures and natural beauty. Dependent on your interests your itinerary can include a major emphasis on snorkeling, diving and exploring, visiting the out of way areas and enjoying the beauty of the islands. If you wish a cultural experience, you can visit some fascinating villages to experience some of their traditional dance and music. The local version of pigeon “Bislama” is quite entertaining. Even a month would not be enough time to explore the beauty and splendor of these Pacific Islands. The Galapagos Archipelago is one of the last great natural places on earth. A voyage to this spectacular destination is an opportunity to experience firsthand some of the most unique and accessible wildlife found anywhere. When naturalist Charles Darwin arrived at the Galapagos in 1835 he was inspired by the unique animal populations he found – giant tortoise, seal lions, penguin, marine iguana, land iguana, and the most famous group of creatures – finches. Each island in the Galapagos has finches with slightly different beaks or other slight variations in size that have adapted to its unique environment. This species of tiny birds, aptly named Darwin’s Finches, became the lynchpin for his work on natural selection. Little has changed among the wildlife found in the Galapagos since Darwin first observed them. The water around the islands is crystal clear and offers many wonderful wildlife encounters. Imagine snorkeling among a colony of playful sea lions, or encountering an iguana swimming in a rocky tide pool. The animals are amazingly tame, and their remarkable trust establishes an instant bond with visitors. Sea Lions play hide and seek with you in the tide pools. Marine Iguanas– shining jet-black in the ocean spray- look menacing but are harmless and complacent. Scarlet-faced lizards climb in and out of lava crevices, while yellow-crowned Night Herons and Galapagos Green Herons stalk armies of Sally Light-foot crabs, that scurry across the lava formations. Tropical Flamingos are reflected in still pools and shy penguins peer from rock outcrops. Nowhere else on earth provides such intimacy with nature. The islands are skirted by peaceful coves, sparkling beaches, and jagged cliffs. There are beaches of black and brown sand and others of pounded shell fragments. The raw beauty of the volcanic craters look as though they have been crafted by a mad yet inspired sculptor. Within this odd scene are great sinkholes filled with azure water and blowholes that the sea blasts through in geyser-like fountains. Each island offers something different. Visit the fur seals on Santiago Island. Walk among the masked boobies and blue-footed boobies on Tower Island. Encounter the ‘Galapagos’ tortoises in the highlands of Santa Cruz Island, or visit the Darwin Research Station and meet top researchers. Hike the summit on Bartholomé Island and take in some of the most spectacular views of the volcanic landscape and nearby islands. The area is considered to be one of the most active volcanic regions in the world. Scenic anchorages, beaches, and winding paths all offer countless opportunities to experience the magic of this archipelago and its amazing inhabitants. Mary Crowley, director of Ocean Voyages, has visited Galapagos ten times and has twice led month-long expeditions. Our knowledge of this area, and the best expert guides, allow us to create an unforgettable Galapagos adventure. The Grenadines are a chain of some thirty-two islands between St. Vincent and Grenada, often referred to as the Gems of the Caribbean. They are some of the last unspoiled islands in the world, for the only way to reach most of them is by boat. In one week of sailing, you may visit many of the islands, and two weeks allows you to visit many more. Trips begin and end in St. Vincent or Grenada. Some of our Ocean Voyages yachts are based at the charming little island of Bequia, which has a nautical heritage in whaling and boat building. You may also sail to Carriacou, Mayero, primitive Petite Martinique, and Petite St. Vincent (an entire island resort ringed by perfect white sand beaches) and of course, the Tobago Cays, a group of uninhabited coral atolls surrounded by reefs that offer some of the finest snorkeling in the entire Caribbean. The Grenadines offer superb sailing conditions- among the best found anywhere. Walk along unspoiled beaches, snorkel in incredibly clear waters, explore tropical hillsides, shop for exotic fruits and vegetables in open markets, enjoy West Indian specialties (fresh fish, lobster, and French wines), dance under the stars to the music of a live steel band- all part of the Ocean Voyages experience. Our Grenadine yachts offer a perfect opportunity to explore one of the world’s finest sailing areas. We have a wonderful selection of yachts that have chosen to call this area home. Our captains know the islands extremely well, and are alos expert sailing teachers for those who are interested in really becoming involved. Our Grenadine sailing programs can offer you fine sailing experiences whether you choose to simply relax (working on your tan, reading, enjoying beautiful beaches), or to fine-tune sailing skills such as navigation, anchoring, and sail handling. New Zealand is often referred to as a sailor’s paradise, with its hundreds of miles of spectacular coastline, innumerable offshore islands, safe sheltered anchorages, temperate climate, reliable winds, and warm waters. Naturalists find the islands and bays teeming with life, and various species of sea birds can be observed. Bush walks along pleasant tracks can be taken from most anchorages, some with delightful groves of Kauri and other native trees. 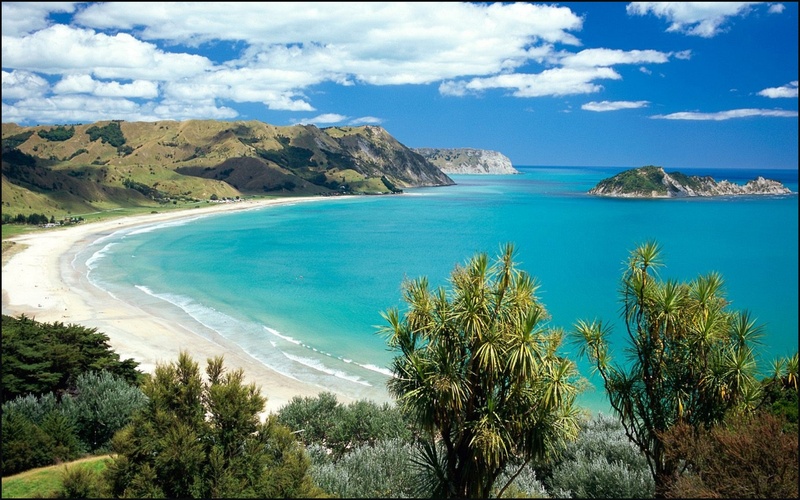 Diving, natural harbors, and a coastline filled with fascinating places to explore characterize New Zealand waters. Sailing up the northeast coast from Auckland is a breathtaking experience. Navigate the Hauraki Gulf, see Great Barrier and the Poor Knights: green and rugged islands scattered with dense mangroves, isolated estuaries and pockets of lush subtropical forest edged with silver beaches. Sighting dolphins and rare bird life, exploring secluded inlets ashore, this is an unique way of experiencing North Island’s wonders that conventional tourism has missed. The bay of 140 tranquil islands is steeped in the country’s early history, at Robertson Island where Captain Cook first landed in New Zealand in 1769, Russell, the former whaling town and the former capital. Nearby is Waitangi where the first treaty was signed between the British and the Maori chiefs. Today the whole area is a scene of overwhelming beauty whose inlets and anchorages can be cruised at leisure. Escape for a few days and enjoy one of the world’s greatest cruising grounds with the excitement of Great Barrier Island or Coromandel. Auckland is justly known as the City of Sails. New Zealand’s largest and most vibrant city is dominated by a graceful harbor and the distinctive cone of the dormant volcano, Rangitoto. To the east is the Hauraki Gulf, one of the most famous boating venues in the southern hemisphere and the perfect proving ground for the Whitbread and America’s Cup yacht races. It is also a spectacular and varied cruising area with seaward protection to the many island havens. And with so many passages and channels to explore exciting and safe sailing is assured. Dropping anchor and going ashore is the perfect way to discover the many walks, wildlife, and delightful communities of these otherwise inaccessible islands. As you sail towards Pitcairn, you approach one of the remotest of the world’s inhabited islands, lying halfway between New Zealand and the Americas. Four thousand eight hundred kilometres of open ocean separate you from them; a few archipelagos lie to the north; and the southern seas are empty to the ice caps of Antarctica. We do not know who first settled this small volcanic island about 9.6 km. round and 4 km. at its greatest length. But settlers there were, for early visitors from Europe found many relics of Polynesian civilization, probably from Mangareva some 490 km. to the north-west. There were roughly hewn stone gods still guarding sacred sites; carved in the cliff faces were representations of animals and men; burial sites yielding human skeletons; and there were earth ovens, stone adzes, gouges and other artifacts of Polynesian workmanship. The tale of the mutiny of His Majesty’s armed ship Bounty, which led to the founding of the Pitcairn community, is well known. From Tahiti with a cargo of breadfruit trees for planting in the West Indies, the master’s mate, Fletcher Christian, and others of the crew mutinied. 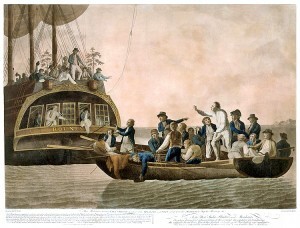 Casting adrift the Commander, Lieutenant William Bligh, and eighteen loyal officers in the ship’s boat, the mutineers sailed the Bounty back to Tahiti, then to Tubuai in the Austral Group. There, relations with the inhabitants soon deteriorated and, spurred by the fear of discovery and arrest, eight of the mutineers set sail with Christian in search of an uninhabited island, secure from the outside world. To help them the men took with them six Tahitian men and, to look after them and be their consorts, twelve Tahitian women. The mutineers reached Pitcairn Island on 15 January 1790. The island was lonely and inaccessible, uninhabited, fertile and warm. The Bounty was anchored in what is now called Bounty Bay and stripped of all her contents, including pigs, chickens, yams and sweet potatoes, which were laboriously hauled up the aptly named Hill of Difficulty to the Edge, a small, grassy platform over-looking the Bay. Then, fearing that if any European vessel sighted the ship retribution would inevitably follow, the mutineers ran the Bounty ashore and set her on fire so that no trace of her, or clue to their whereabouts, would remain visible from the sea. On arrival the mutineers made themselves rough leaf-shelters where the village of Adamstown now stands, but the tiny community did not settle down without friction and, indeed, murder. 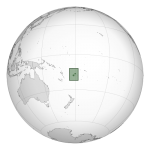 The Tahitians were treated more as slaves than as fellow human beings and their revolt led to the slaying of some of the mutineers and, finally, to their own deaths. By 1794 only Young, Adams, Quintal and McCoy remained of the male settlers, leading households of ten women and children. The next four to five years were peaceful except for occasional outbreaks by the women, including an abortive attempt by some to leave the island. As Young recorded in his journal: “building their houses, fencing in and cultivating their grounds and catching birds and constructing pits for the purpose of entrapping hogs, which had become very numerous and wild, as well as injurious to the yam crops”, kept the settlers busy. Gradually the men and women grew reconciled to their lives and to each other, and all might have remained harmonious had not McCoy, who had once worked in a distillery, discovered how to brew a potent spirit from the roots of the ti plant. By 1799, Quintal had been killed by Young and Adams in self defence and McCoy had drowned himself. Then, in 1800, Young died of asthma, leaving John Adams as the sole male survivor of the party that had landed just ten years before. The American trading ship Topaz under the command of Mayhew Folger was the first to visit the island and communicate with them when they spent 10 hours at Pitcairn in February 1808. A report of Folger’s find was forwarded to The Admiralty mentioning the mutineers and a more precise location of the island—latitude 25° 2′ S and 130° longitude/,—however this rediscovery was not known to Sir Thomas Staines who commanded a Royal Navy flotilla of two ships (HMS Briton and HMS Tagus) which found the island at 25°.4′ S. (by meridian observation) on 17 September 1814. Staines sent a party ashore and wrote a detailed report for the Admiralty. The island became a British colony in 1838 and was among the first territories to extend voting rights to women. By the mid-1850s the Pitcairn community was outgrowing the island and its leaders appealed to the British government for assistance. They were offered Norfolk Island and on 3 May 1856, the entire community of 193 people set sail for Norfolk on board the Morayshire, arriving on 8 June after a miserable five-week trip. But after eighteen months on Norfolk, seventeen of the Pitcairners returned to their home island; five years later another twenty-seven did the same. Since a population peak of 233 in 1937, the island has been suffering from emigration, primarily to New Zealand, leaving some fifty people living on Pitcairn. 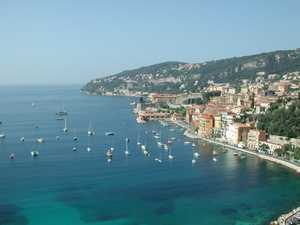 The Riviera, or Côte d’Azur, is one of the most striking and culturally rich coastlines in the world. It ranges from the southernmost part of France along the west coast of Italy and the long, narrow stretch of coast nestled between the Alps and the Mediterranean Sea. Sophisticated and experienced travelers have enjoyed the beauty of these world-famous cruising grounds for years. There is no better way to ‘arrive’ in the port cities of Antibes, Monte Carlo, St. Tropez, or Cannes than on your own personal yacht. Once aboard, let your professional crew pamper cater to your every need. You can enjoy a continental breakfast in Cannes and dine on oysters and champagne for lunch at the Hotel du Cap on St. Jean-Cap-Ferrat. Many of the desired ports and anchorages on the Côte d’Azur are just a few hours apart. There are many harbors and marinas along the coast, but Antibes seems an all time favorite of many travelers with its authentic seaside markets and great traditional shops. We can set up day trips to small villages, such as Grasse and visit the French perfumeries, or discover hidden antique treasures, or local hand painted ceramics while shopping in the Provençal countryside. Sail among the spectacular tropical islands of the Iles Sous le Vent and discover the real French Polynesia with its lush foliage, opalescent seas, native villages, deserted beaches, and colorful reefs. Here you’ll find that the South Seas atmosphere still exists today- small dockside markets, inter-island schooners, local bars, and the easy tempo of island life. These outer islands of Tahiti compromise one of the best cruising areas of the South Pacific. Our charters sail here regularly in the area of Huahine, Raiatea, Tahaa, and Bora Bora and can also include the islands of Tahiti and Moorea. The islands of the Tuamotous and Marquesas can also be visited. As you sail among the islands you will experience great natural beauty and a explore a fascinating cultural mix of Polynesian and French Colonial. You will enjoy swimming, snorkeling, diving, windsurfing, shelling, beach-combing, reef walking, and surfing. Thailand and Malaysia, located east of Burma and South of China and Laos provide extraordinary sights for visitors and exceptional experiences for divers. For nature lovers there are remote jungles, pristine beaches and tropical islands to explore. If you like spending your time underwater, the coral reefs provide a fantastic view into the marine world. Puttaya, Phuket and Similan Islands are just some of the places in Thailand which draw divers from all regions of the globe.